ENCINITAS — The preservationist owners of the iconic Encinitas Boathouses has embarked on a renewed push to restore them to their old glory — and make them open to the public. 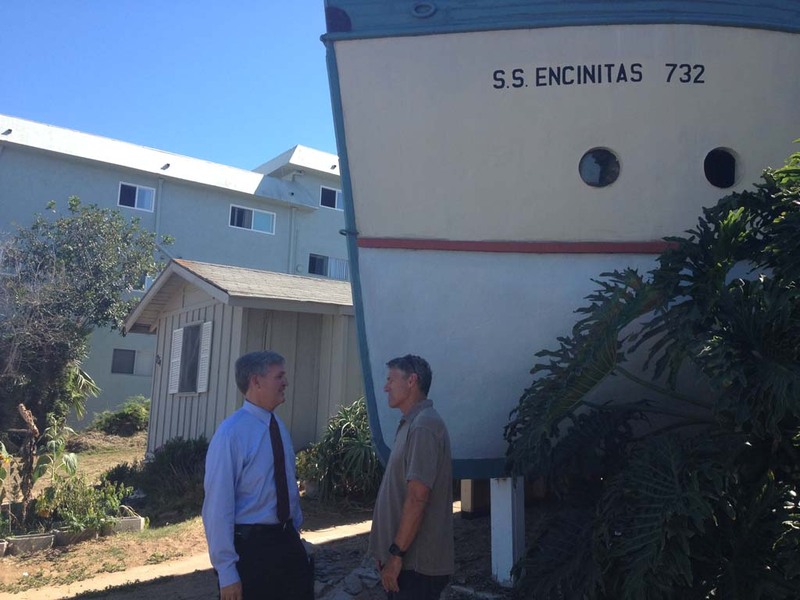 Representatives of the Encinitas Preservation Association, which in 2008 purchased the iconic boat-shaped homes on Third Street, said it will take $250,000 to restore the boats, including extensive foundation work and a plumbing overhaul. To that end, they have begun making inroads with city, county and nonprofit officials to pitch in to the effort, which was originally thwarted five years ago due to the recession. The S.S. Encinitas and S.S. Moonlight, as they are named, were never seaworthy vessels, but built in the late 1920s by Miles Kellogg, an eccentric engineer with a penchant for incorporating scraps into new structures. He created the twin vessels out of scrap metal from the old Moonlight Beach bathhouse. The association purchased the boathouses and an adjacent four-unit apartment complex for $1.55 million. Part of the down payment came from city affordable housing funds, which were used to acquire the apartment complex, which sits behind the boathouses, and convert them into affordable units in perpetuity. Passersby daily walk past the cream-and-sky blue nautical monuments, stop, take pictures and marvel at the boats, which are actually two-story homes that the association rents to help pay off the debt associated purchase. A single mother and her children currently rent the “Encinitas;” the “Moonlight” is home to a newlywed couple. Ultimately, however, the plan is for the boats to become a museum and to be added to the National Register of Historic Places, Cozens said Tuesday during a private tour with County Supervisor Dave Roberts. The tour comes just weeks after Cozens approached the City Council to request funding from its community grant program to assist with the effort. The city obliged with a $3,500 donation. Cozens approached Roberts about potentially securing grant funding from one of the county’s three community grant pools to spur restoration efforts. Each supervisor is given an annual budget from the three funds from which they propose a work plan that the full board approves. Roberts said he looks for projects that help preserve the community character of the cities in his district. Roberts said he has to get clearance from County Counsel before making any funding pitches to the board. Cozens said the association has heated up its restoration efforts due to the improving economy, which has thawed potential donors who had cooled toward making such donations during the Great Recession.